“The Congressional Budget Office’s report shows what many of us already suspected: It’s not about helping more people find coverage, it’s about putting more money into the pockets of the wealthy at the expense of everyone else. 24 million Americans stand to lose insurance coverage because of this plan, and lost insurance coverage equals debt, sickness, and worse for too many working people. Oregon Congressman Greg Walden has been at the center of the efforts to repeal and replace the ACA, even though residents in his district overwhelmingly benefit from it. At the same time, Congressman Walden has been notably absent from town hall meetings in his district. If you live in Congressional District 2 (Unsure? Click here to find out), please click here to send a message to Congressman Walden and ask him to attend town hall meetings to hear constituents’ concerns. If you do not live in Congressional District 2, click here to sign a petition. Need more info about why the ACA repeal is a bad idea for working people? Click here. King’s latest racist remarks drew praise from Ku Klux Klan leader David Duke, who tweeted “GOD BLESS STEVE KING,” and sharp rebukes from just about everyone else, including fellow Republicans in Congress and former Gov. Jeb Bush, just to name a few. While this story is making headlines, there’s been scant attention paid to how King’s policy agenda reflects his white nationalist views. King is the author of the federal bill that would impose a so-called “Right to Work” scheme nationally, which would be devastating to our country’s economy and would hit workers, especially people of color, square in the pocketbook. Backed by an array of wealthy corporations and secret deep-pocketed donors, these laws have proliferated in Republican-controlled states across the country, leading to lower wages and fewer benefits for not just union workers, but all workers in those states. People of color – particularly women of color – are hit hardest by these laws which fuel income inequality and put their American Dream further out of reach. According to the Economic Policy Institute, wages in so-called “Right to Work” states are 3.2% lower than in non-RTW states. Health insurance and retirement security are scarcer. So why would any policymaker push legislation that lowers wages? One obvious reason is that big corporations love these laws, because they undercut the ability of working people to stand together in a union to demand fair wages and decent benefits for a hard day’s work. But if you look at the history of these laws, there’s even a more sinister reason behind them: Racism. Many attacks on labor unions have roots in white supremacism. Which brings us back to King. It’s no coincidence that the most racist member of Congress is also the staunchest supporter of a national “Right to Work” scheme. In the view of King and many other extremists, labor unions must be destroyed because immigrants and people of color have a better shot at the American Dream when they are able to organize and join unions. Lower wages for everyone, including blue-collar whites, is just collateral damage in King’s view. Supporters of these laws will never admit to the racist origins of “Right to Work.” And they certainly won’t cop to the widening inequality gap these laws create. But make no mistake; racism is central to the hidden agenda. Supporting national “Right to Work” is tantamount to supporting King’s racist worldview. That’s a message every member of Congress needs to hear. Oregon is in a housing crisis; especially when it comes to renters. Rents are rising much faster than wages for too many Oregonians, and working people are losing their homes through no fault of their own due to the practice of "no-cause evictions." This has fueled a rapid rise in homelessness, housing instability, and the crushing of dreams for many families. 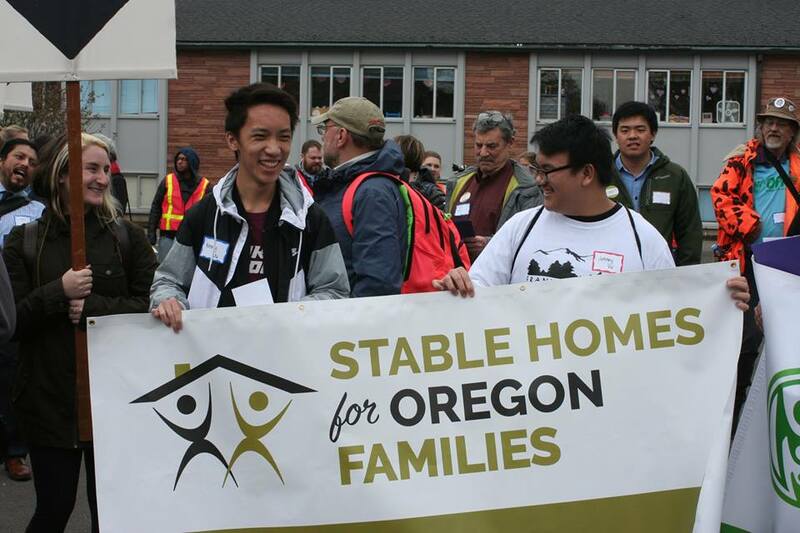 Communities across the state are being impacted, and it will take all of our voices speaking up to bring the change we need to provide stable homes for working Oregonians. Tell your legislators: it's time to protect working people from losing their homes through no fault of their own. Click here to take action and write to your legislators today.